patterns > Shaken, Not Stirred! 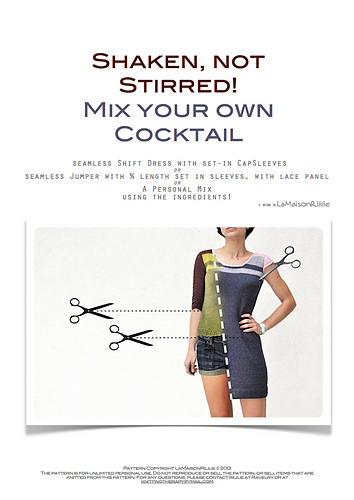 In this little PDF you will find two complete patterns, one for a dress/tunic with cap-sleeves - The Cocktail(Dress) - and another for a pullover with ¾ sleeves - The Cocktail(Jumper). This PDF provides 4 different modification possibilities described in detail, next to the complete patterns for the dress and the jumper. Both patterns are structured similarly. Their differences are in the length of the garment itself, the sleeve length, the stitch pattern used for the shoulder saddle & sleeve panel and the hem construction. Since both patterns use the same construction and stitch count, you can make your own version by taking one of the different parts from one garment and mix it with the other one: So if you choose to have a dress with longer sleeves or a top with cap-sleeves or if you just prefer the stitch pattern of one but would like to use it to make the garment of the other pattern, you can easily modify your project. And each of these modifications is written out in detail, to save you time!